Whether you are trying to lose weight or looking to get healthier, then start by drinking one of these natural drinks. These nutrient-rich drinks not only helps in losing weight fast but also gets rid of harmful metabolic waste in the body. Prevents cancer, lowers cholesterol and improves digestion. It also improves the eye health. Directions: Combine all ingredients into a blender and process until smooth. Pour into a glass and serve. As one of the richest fresh fruit source of vitamin C, it helps boost the immune system and fight against infections. It also acts as a mild natural diuretic. Directions: Using a glass of warm water (not boiling water), mix honey with lemon juice. Take this daily, preferably once in the morning on an empty stomach. Directions: Add thinly sliced cucumber, mint and lemon into pitcher containing water. Refrigerate for at least 4 hours then serve. Ginger has a long history of use for relieving digestive problems such as nausea, loss of appetite, motion sickness and pain. It also helps a great deal in weight loss treatment especially when used with lemon. Directions: Add lemon juice to a glass of water. Finely grate the ginger by using a zester, and then add to the glass of water. Then serve, preferably as first thing in the morning. Cinnamon can be used to help treat muscle spasms, vomiting, diarrhea, infections, and common cold. Apart from its weight loss benefits, it also helps reduce blood sugar level in people with type 1 or type 2 diabetes. Directions: One part cinnamon and two parts honey is what is required for this weight loss recipe. Add a cup of hot water to the cinnamon and let cool. Then add honey to the cooled liquid (as hot liquid will destroy the enzymes in the raw honey). Note: Drink this twice a day: 1/2 cup in the morning and 1/2 cup before going to bed. Directions: Wash all produce well. Peel the grapefruit and lime, and juice all ingredients in a blender until smooth. Then serve at least once a day. Contain high amounts of vitamin C that helps boost immune system. Also contains important carotenoids and bioflavonoid that are good for the skin, eye, brain and digestive system. Directions: Wash the produce well. Remove the rind from the cantaloupe and peel the grapefruit and lemon. Add all ingredients through juicer and enjoy! Bromelain, the enzyme found in pineapples, can reduce swelling, bruising, healing time, and pain associated with injury and surgery. Also, its high vitamin C content helps increase immunity to diseases. Directions: Wash all produce well. Peel grapefruit and lime (optional). 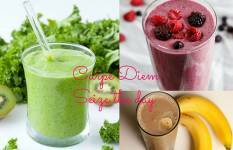 Add all ingredients through juicer and enjoy! Mint is an excellent digestive aid and can help reduce wind and flatulence and settle an upset stomach. It also acts as a powerful antioxidant. Directions: Wash all ingredients well. Peel the lime if you prefer and chop the ingredients as needed. Put ingredients through the chute. Serve and enjoy this fresh minty juice over ice! Honey contains flavonoids, antioxidants which help reduce the risk of some cancers and heart disease. It also helps reduce cough and throat irritation. Directions: Add all three (3) ingredients to a cup of hot water. Serve at least twice a day to achieve the best results in losing weight. Amy is a health and nutrition blogger. She has over 6 years experience writing content online in the health and fitness niche across many blogs and websites . Her articles are mostly cornered towards healthy eating and general body fitness. Her goal in life is to make healthy living inspiring, entertaining and educational.